Remains east of Bonnie Claire ghost town in Nevada. Photo by Kathy Weiser-Alexander. There was no greater time in American history than the wild west. This was the age of exploration, and as the men and women of a new nation made their way westward, many of them made a name for themselves. Everyone is familiar with names like Wild Bill Hickok, Wyatt Earp and Billy the Kid. However, there were also many famous women who staked their claim and helped write the history of the wild west. These women had to be strong and independent, and nobody made it very far out west without knowing how to use a gun. Women like Annie Oakley, Calamity Jane and Belle Star were breaking through gender barriers in a male-dominated society. These women helped to shape our nation and left a lasting impact on the American story. Here are a few of their inspiring stories. 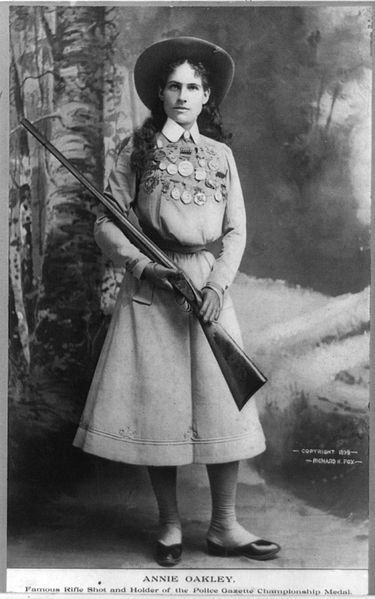 Annie Oakley was perhaps the most famous female shooter in American history. Even today, many skilled marksmen still marvel at the amazing shooting feats she performed on stage. Born Phoebe Ann Moses in 1860, she became one of the most famous women of the 19th century. Oakley learned to shoot at a young age because her family’s livelihood depended on her hunting and trapping skills. She became famous when she joined the legendary Buffalo Bill’s Wild West Show, which introduced her to a much larger audience. One of Oakley’s greatest feats was shooting a playing card in half from 30 yards — not only once but multiple times in a row until the card was obliterated. Also, at one point she held the future of the world in her hands when she shot a cigar from the mouth of Kaiser Wilhelm, the German Emperor. Had she missed, she could have changed the course of history. It wasn’t like Oakley to miss her target, as she earned the nickname “Little Sure Shot” from Sitting Bull, who was also a member of Buffalo Bill’s Wild West Show. Throughout her life, Oakley never forgot about her early years in poverty, and she often donated a portion of her earnings to charity. Oakley was also a leader in an early feminism movement. When the U.S. was preparing for the Spanish-American War in 1898, she gathered a group of 50 female sharpshooters to join the Army. They were turned away, but it didn’t stop Oakley from teaching other women how to shoot. She is credited with teaching over 15,000 women how to handle a firearm. 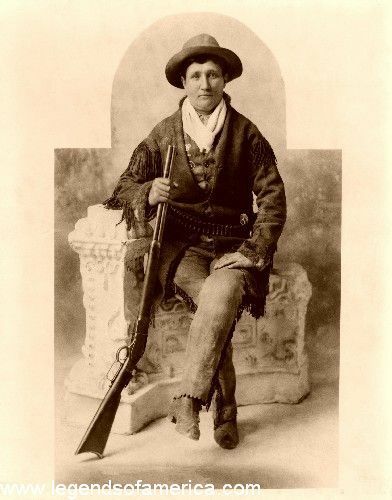 Calamity Jane made her fame doing one of the most dangerous jobs in the Wild West. Born Martha Jane Canary in 1852, she gained notoriety as a scout for the U.S. Army on the frontier and fought in many wars against the Native Americans. A number of brave deeds were attributed to her during these fierce battles. Her actions garnered a large amount of fanfare from the press, and she became very popular throughout the West. She was very close friends with the famous gunslinger and lawman known as Wild Bill Hickok. They traveled to Deadwood, South Dakota together when it was one of the most dangerous cities in the country. Calamity Jane claimed that Wild Bill was the only man she ever loved, and, according to her last wish, she was buried next to him after her death in 1903. Calamity Jane also spent some time with the Wild Bill Cody Show. While she wasn’t shooting onstage like Annie Oakley, she traveled with the show and shared stories of her times out west. This became a popular attraction, and many people came to hear about the life of this impressive woman. While Calamity Jane was one tough frontier woman, she also had a compassionate side. After Bill Hickok’s death, she spent her remaining years tending to the sick. She even cared for those with deadly typhoid fever, which was highly contagious. Calamity Jane is another of the strong women who helped tame the Wild West. 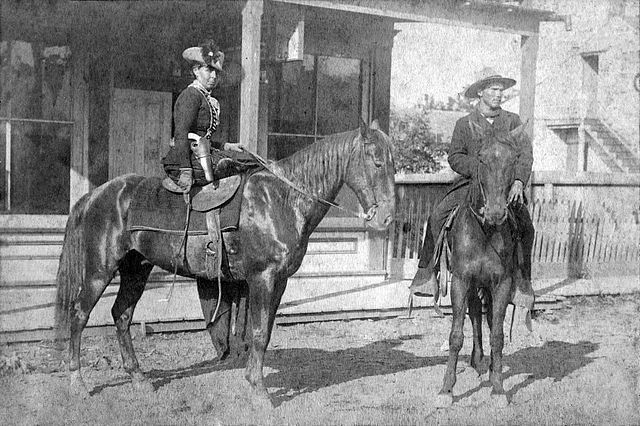 Belle Starr found herself on the other side of the law. Born Myra Belle Shirley in 1848, she was a member of Jesse James’s Younger gang and helped commit a string of robberies and other crimes in the Wild West. However, her wild streak started at an early age, as she worked for the Confederacy during the Civil War, reporting on positions of the Union troops. This is also where she became acquainted with Cole Younger and Jesse James. Her close affiliation with these groups led her to a life of crime, including counterfeiting money as well as robbing banks. She also dressed the part, as she was oftentimes seen wearing a black velvet dress, cowboy hat and two gun holsters as she rode side saddle her horse. Her life of crime continued well into her older years, as she was once quoted as saying, “I am a friend to any brave and gallant outlaw.” She live the rest of her life stealing horses, money and anything else she could to make ends meet. It all came to an end in fitting violence when she was shot in the back in Eufaula, Oklahoma while riding back into town. Often the women of the Wild West are overlooked by history books. However, these strong and independent gunslingers left their mark on American history. Women like Annie Oakley and Calamity Jane helped to pioneer the west. While women like Belle Star found themselves on the wrong side of the law, they all made a cultural impact. This age of exploration allowed women to take on more adventurous roles, and their legacies, both good and bad, are part of our nation’s complex history. Article submitted by Concealment Express, October 2018.